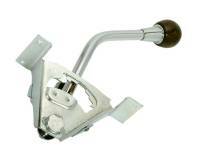 4-Speed Plastic Woodgrain Shifter Ball. Fits A-& B-Bodies Mid-968 Thru All of 1969. 1966-69 A- & B-Body Automatic Shifter Mechanism Assembly with Shifter Knob. 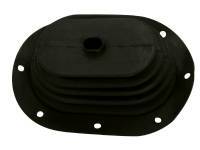 1966-74 A-Body 3- or 4-Speed Shifter Boot, Non-Console. 1970 A- & B-Body Automatic Shifter Mechanism Assembly with Shifter Knob. 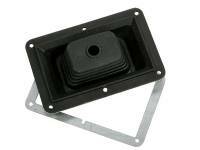 A-Body Console 4-Speed Shifter Boot. 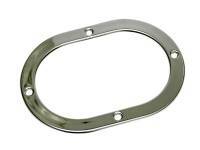 A-Body Manual Transmission Shifter Ring. 1966-Early 1969 B-Body, 1966-69 A-Body Automatic Shifter Knob. 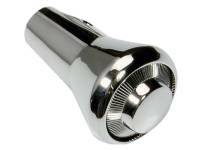 This is the Chrome Part That is Below the Plastic Grip Handle. 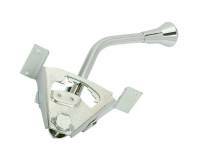 This is the Upper Chrome Bezel That Fits at the Top of the Pistol Shifter Above the Plastic Handles. These Reproduction Pistol Grip Shift Pattern Inserts Fit in the Upper Bezel of All Pistol Grip Shifters. When Ordering, Please Specify What Style Pattern from the Following Choices: 3-Speed, 4-Speed, 5-Speed, 6-Speed w/No Reverse, 6-Speed w/Reverse Forward by #5, 6-Speed w/Reverse Back by #6, Auto Pattern (P R N 3 2 1), Reverse Auto Pattern (P R N 1 2 3), New Challenger & Charger Black Disc with No Writing.